rec. Swedish Radio Studio 7, Malmö, Sweden, 27 May 2005. Peter Shore, whose project this is, has been championing Tovey�s music for upwards of twenty years. Peter is distantly connected to Tovey. His paternal grandmother was Tovey�s first cousin. Mention of Tovey would be incomplete without reference to his Essays in Musical Analysis. These were published between 1935 and 1939 in six volumes. A seventh (Chamber Music) appeared posthumously. In addition to his writings on music and his BBC broadcasts he composed, though not prolifically. There are various chamber works, a symphony, an opera and concertos (one each) for piano and cello, the latter for Casals. Tovey had his meed of celebrity performances and was a close friend of Joachim. He played the piano in a performance of the Brahms Piano Quintet with the Joachim Quartet. London, Berlin and Vienna experienced performances of his works during the pre-Great War decade. He was born 17 July 1875 and died 10 July 1940. His dates are similar to those of another British composer, Frank Bridge (1879-1941). Tovey however was less the revolutionary. Some might say he remained truer to his star than Bridge whose embrace with dissonance (quartets 3, 4, Piano Trio 2, Phantasm) might, in a crueller light, be seen as fashion-following. Tovey�s long span of glory days with the Reid Orchestra (which he founded) began in 1914 when he took up a Professorship of Music at Edinburgh University. These concerts are all too easily forgotten with all the attention focused on Godfrey in Bournemouth and Wood in London. The programmes were often challenging and included the premiere on 15 October 1931 of another work issued this month on Warners: John Foulds� Dynamic Triptych. Speaking of Godfrey we should note that Merrick and Godfrey gave the Foulds work its broadcast premiere on 4 August. While as a composer Foulds was something of a wild Grainger-like revolutionary having more in common with Chisholm and Cecil Gray than with Parry and Stanford. Tovey as a composer leaned towards the solid legacy of the nineteenth century. Tovey�s 1903 Piano Concerto was recorded some years ago by Hyperion http://www.musicweb-international.com/classrev/2000/feb00/tovey.htm and http://www.musicweb-international.com/classrev/2002/Aug02/Toveypc.htm. There was talk of a recording of the Cello Concerto as performed by Mats Lidstrom but this failed to come to anything. The decayed and damaged Casals broadcast of the Cello Concerto from 17 November 1937 was salvaged from acetates and issued on Symposium 1937. 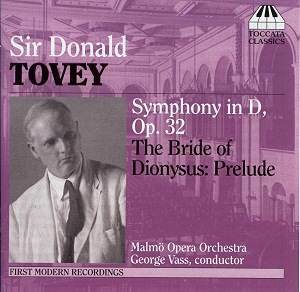 Tovey�s The Bride of Dionysus is his only opera and was written between 1907 and 1918. It is in three acts. With the exception of some Sibelian woodwind the music of brief Prelude has a serenely Germanic accent in the manner of Pfitzner and Bruckner. This is soothingly pleasing music setting a mood of Olympian calm for the Theseus-Ariadne-Phaedra drama. It is good to be able to hear this so smoothly projected by Vass and the Malmö folk and with such concentration. Certainly an improvement on my old 1970s tapes of the prelude as conducted by Harry Newstone and Christopher Seaman. The Symphony came about at the request of Fritz Busch, then conductor of the Aachen Orchestra. Tovey had travelled to Aachen in 1913 to play his piano concerto and the commission followed from that meeting. The premiere date was set for 11 December 1913. Working at the last moment Tovey completed it only just in time. There was a London premiere on 31 May 1915 with the LSO conducted by Henri Verbrugghen. Tovey and Vass never leave the listener in any doubt about this being a symphony of the utmost gravity. While it has some moments of impetuosity this is a gaunt work of swarthy Brahmsian complexion. Sobriety, warmth and depth are the order of the day. Among Brahms� works the closest brethren are the Tragic Overture and the First Symphony. The work is not without its luminous moments and many of the passages for strings glisten in sumptuous colours. One can imagine how it would have sounded in the caressing hands of Ormandy with the Fabulous Philadelphians or Barenboim and Chicago giving it the treatment they gave their Warner recording of Furtwängler 2 a couple of years ago. This is not quite in that league but the performance is good both from the head and the heart. The Pfitzner of the Palestrina Interludes also came to mind several times. The second movement is playful in the manner of Beethoven�s bubbling woodwind-accented energy recalling the exuberance of Beethoven 5 and 7. The Canzona Dorica-Adagio (III) is serene never lumpen. Forward movement is not sacrificed and the buttery warmth of the strings makes a memorable impression. The finale flies along on Mercury�s wings. The proceedings are lent majesty by the Nielsen-belling french horns casting their affirmative benediction over the finale. At its climactic peak the music conveys a lofty euphoria as if some rite had been completed, mysteries possessed. In the last five minutes it is as if the listener is surrounded by streaming clouds of Olympian glory. You should bear in mind that Symposium have recently issued Symposium 1352 which comprises a transcription of a broadcast recording of the Tovey Symphony. This recording, made on 25 February 1937 from an Usher Hall, Edinburgh performance by the Reid Symphony Orchestra conducted by the composer, will be essential listening for the growing ranks of Tovey enthusiasts. Apart from the dated sound it should be noted that bars 70-74 representing about 9 seconds of music are missing from the fourth movement. I am hoping to review this CD later. The Tovey Symphony is a work of gravity that is often solidly and even densely orchestrated in a Brahmsian fashion. Tovey surprises with some adroitly numinous woodwind writing that curvaceously limns the massive moments. His writing for French horn is life-enhancing. Altogether a winning package provided you are well attuned to an essentially nineteenth century epic symphonic approach. We are assured that Toccata have the Cello Concerto in their sights and after this will be tackling the chamber music. Fascinatingly Martin Anderson�s company will also be recording the complete orchestral works of R.O. Morris. The present disc is a highly desirable and well-documented purchase for all those wanting a satisfyingly Brahmsian sturdy symphony of epic ambition and execution. The prelude forms a suave scene-setter for the symphony.